I love this easy family dinner recipe because the slow cooker does all of the work. It slowly and perfectly infuses the chicken with garlic while I go about my day. The butter adds to the richness and helps keep the chicken moist. 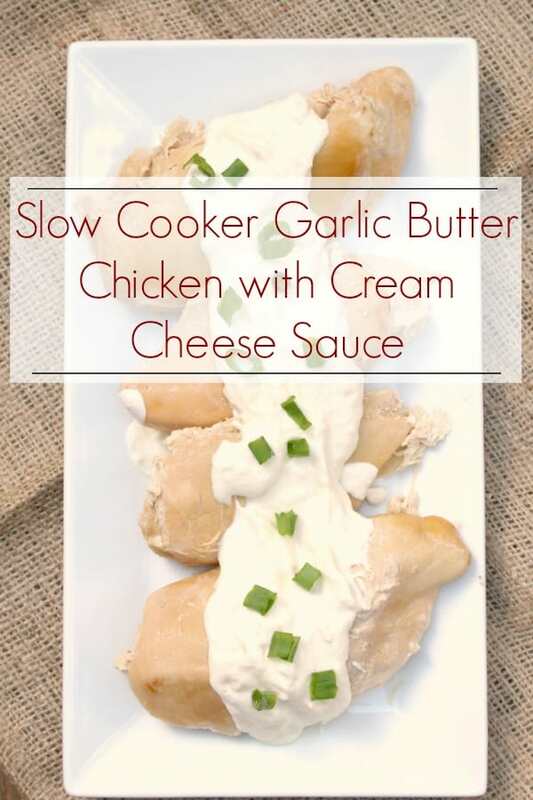 The cream cheese sauce rounds out the dish with a tangy taste and sweet undertones. Yes, I’d say we’ve achieved umami with this one. But, you should totally taste for yourself! Oh, and if there could another “best thing” about this recipe it would be that my kiddos love it. Let’s recap – This dish is keto-friendly. This dish is busy-mom friendly. This dish is kid-friendly. Yep. That’s a winner-winner chicken dinner, folks. By the way, if you’re looking for more easy keto recipes, check out The One Pot Ketogenic Diet Cookbook. It has 100+ easy weeknight meals for your slow cooker, skillet, sheet pan, and more. Place the chicken (thawed) in the slow cooker. Add the butter to the slow cooker. Place the garlic in the slow cooker, dispersing it around so it’s not all in one spot. In a pan, put the cup of chicken stock (or liquid from the slow cooker). Cook over medium-low heat until the sauce is combined and creamy. 1 cup of chicken stock I use the liquid left in the slow cooker after the chicken is removed. Place the garlic in the slow cooker, dispersing it around so that it's not all in one spot.